Find out how to groom a whippet, take care of the nails and deal with the most common dog skin problems. The whippet silky coat is a pleasure to the touch and has the added bonus of a very easy maintenance. The short coat of this breed will keep the house free of dirt and loose hairs. The whippet coat is odorless to boot, making this breed a favorite of lazy housekeepers like me. As unashamedly biased whippet fans, we find that, on top many other charms, this breed offers the advantage of shedding very little. Whippets need no clippings and baths are an easy routine thanks to their short, wash and wear coats. To groom a whippet is easy, a weekly brushing with a rubber glove and a bath when needed, is all it is required to keep your whippet’s coat free of dead hair and impurities. Make sure to keep among your dog grooming supplies an appropriate shampoo, the pH of dog and human skin is different and they require different products. Most whippets are not crazy about water but in time your pet will associate bathing time with a good cuddle and a massage and will learn to appreciate this special treat. To avoid any bad experience with a slippery bath tub, add a rubber mat for sure footing. Your dog will be more relaxed and easy to handle. First wet the skin and then work a lather. Its important to rinse carefully to avoid dandruff and itchiness. A little manicure is essential to groom a whippet. 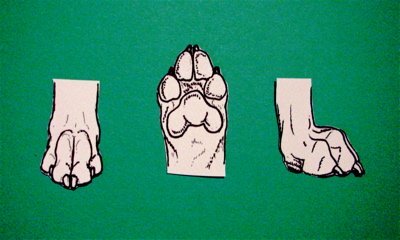 Long nails can cause the foot to spread out, with discomfort for your pet and eventually lameness. 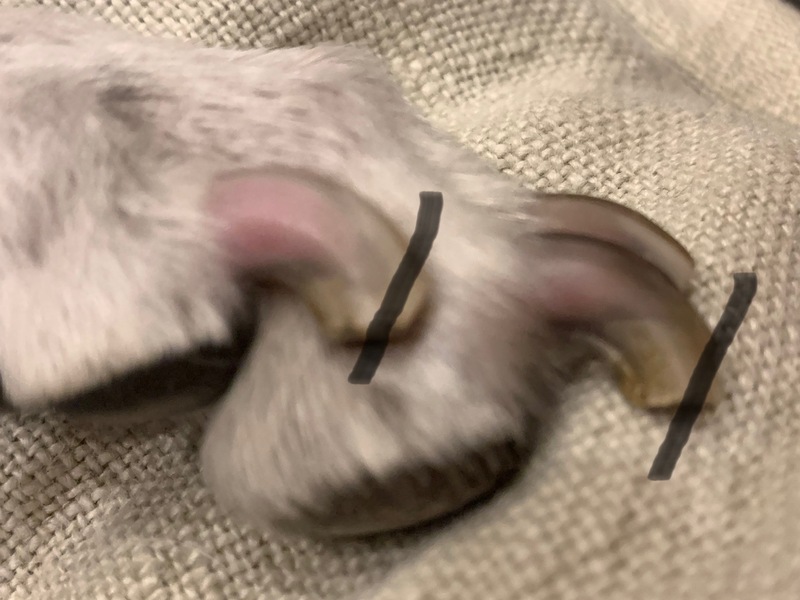 The dew claws (the fifth digit on the front legs) if left untrimmed can get caught easily while the dog is running. Here is a picture of a whippet foot in good shape and with a good nail length. To get your whippet used to his weekly manicure, begin when he is still a puppy. Nip off just a little bit of nail and reward good behavior with praise and a treat. It is safer to trim a little often than letting the nails grow until they cause trouble. In light colored nails is easy to see the quick inside. In the picture is indicated in red. This is where the blood vessels and nerves run and it must not be cut. If by accident you get too close and happen to cut the quick, some bleeding may occur and it can be stopped with styptic powder. Although the bleeding may look worrying and it is certainly painful for the dog, this injury it is not dangerous and is self healing. Especially in dark nails where you can’t see the quick just trim the tips to avoid any trouble. To be on the safe side, cut just the top of the nail, not right across it. The top is the hardest part and the bottom will wear off easily with walking. To make nail trimming real easy and safe use a dog nail grinder. It shortens the nails safely and effectively. Really easy to use, it's a stress free solution for you and your dog. The first time you use the trimmer, let your pet touch, smell it and listen to the noise of the device. Alternate the nail you are working on to avoid overheating. Keep the session short, and don't forget to praise and reward lavishly good behavior. I like to do it in front of TV, armed with patience and a good supply of treats (for me and my dog). While you groom a whippet also check the ears for signs of inflammation, foul smell or discharge. If you see a waxy matter that looks like ground coffee, it could be a sign that your dog has an ear mite's infestation and you need to see your vet about it. It is often recommended to brush your dog's teeth to prevent tartar build up but frankly, I find bone chewing more effective in cleaning my whippets' teeth. 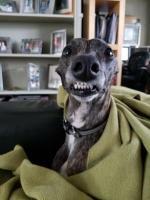 Sometimes whippets and greyhounds show a callus on the sternum where the bare skin touches the floor when laying down. It may look worrying but my vet said is harmless and it doesn’t cause any discomfort to the dog. To keep the skin supple and avoid inflammation, I apply a moisturizer for blemished skin with good results. 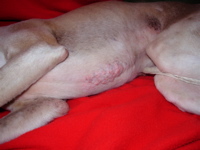 In short coated breeds like whippets, a bald patch can show at the base of the tail. It is called stud tail although it may appear also in females and castrated males. This bald spot is caused by an overactive or infected sebaceous gland in that area. If no other problems are found by your vet, washing with a gentle shampoo for oily skin is often the solution to this merely aesthetic problem. Especially on dark dogs, dandruff may appear. Shampoo containing sulfur or tar can be of help. As dandruff becomes more evident just after a bath, avoid bathing your whippet just the day before a dog show.